When the Pennsylvania Academic Library Consortium, Inc. (PALCI)  decided to upgrade its resource sharing software (EZ-Borrow) all of the participating libraries – among them Lehigh University – were responsible to have in place an implementation of the NCIP protocol to provide communication between the new EZ-Borrow software developed by Relias International  and their respective ILS. Licensing the SirsiDynix web services appeared to involve the least amount of effort, but it had a price tag. Using the XC Toolkit meant that we would need to write Java code to make the calls to the SirsiDynix catalog API. This is because the XC NCIP Toolkit ‘core code’ takes care of the mechanics of the NCIP web services but the connector (additional Java) code needed to communicate with the SirsiDynix API had not been developed yet. Often a picture is worth a thousand words so I’ll throw one in now. 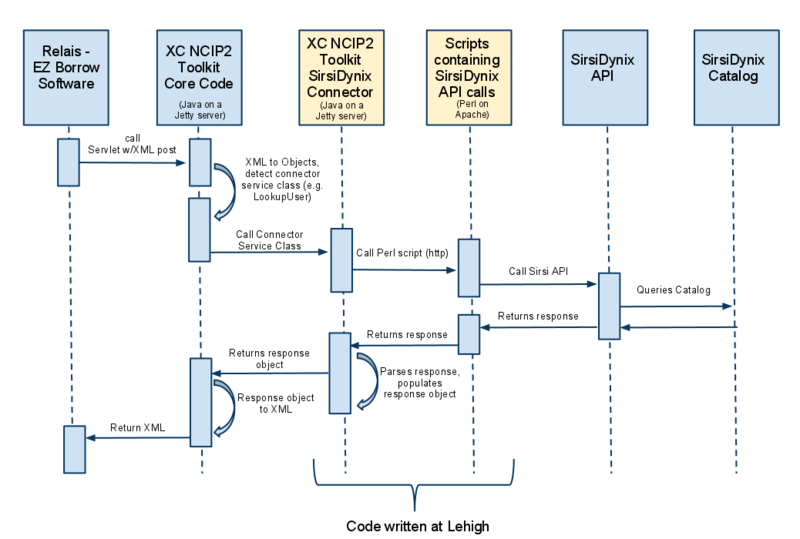 The diagram shown in Figure 1 gets ahead of the story but paints a picture of the XC NCIP Toolkit core code functionality and the role of the needed connector. To bridge the Toolkit to the SirsiDynix catalog we needed to write Java code that would call the catalog’s API and return the results back to the core Toolkit. The eXtensible Catalog Organization is building a library of open source connectors for various catalog products. At the start of this project, a SirsiDynix connector had not yet been written. When we learned that we would not have to support the entire NCIP protocol, but rather only four of the services, we knew the job of writing connector code for the Toolkit or creating our own solution would be achievable in the amount of time we had (a couple of months). If the new Relais EZ-Borrow software had required us to support the entire NCIP protocol, we may have taken an entirely different approach. That undertaking would haven taken much more time. Since the XC Toolkit was available at no cost, we thought we should explore its capability before thinking about how we could possibly write our own solution. So Lehigh decided to put its newly hired Java developer (me) and its SirsiDynix Symphony API expert (Mark Canney) to work exploring the Toolkit and developing a solution. Writing connector code that would make the API call to SIRSI, parse those results, and return the results to the core Toolkit code. The proof-of-concept development went well. I found the XC Toolkit code easy to work with and the performance tests I ran against it looked good. We demonstrated the prototype to our Library management team. They were happy…I was happy…so we decided to move forward with the project using the XC Toolkit. I should also mention that XC has written two versions of the Toolkit. The second version developed to support the NCIP 2 protocol. It was just around the time of this project that XC was finishing up work on version 2. We decided to move forward with version 2 since the Relais software would support either NCIP version, and because we knew eventually we would want to use the latest protocol. My goal in writing this article is to share the technical details of this project’s implementation in order to bring a level of clarity to other organizations looking for a way to communicate with their catalog via NCIP. To that end, the sections of this article that follow elaborate on all of the technical details of the setup, coding, testing and deploying of this project. I have previously installed Eclipse, Tomcat, Maven and Subversion. To get started I wanted to get the Toolkit (core code) running as a project in Eclipse using my local Tomcat server. This setup would allow me to easily debug the entire process (not just the connector code I would be writing). It would also allow me to make any changes (that I might need to make) to the core code. Initially, because of something not expected in the XML Request from Relais, I did have to modify the core code. As the project progressed Relais adjusted their XML Request which enabled me to run the Toolkit code without any modifications. There are many different ways to download the NCIP XC Toolkit. In fact, there are multiple approaches and tools for much of what is included in this article. Take these ‘steps’ with a grain of salt and adapt and implement as you like. This gives you all of the XC NCIP2 Toolkit core code. My next steps could be somewhat controversial. I created a new project in Eclipse to import this code into. However, I changed the project structure (folders that the files live in) just slightly to create a structure that I prefer mainly so that I can easily debug and ‘hot deploy’ any code changes I want to make without having to wait for a ‘build’. This structure allows me to do so without having to do any extra Tomcat/Maven configuration. In other words, in my Eclipse development environment (on my workstation) – for this project – I take Maven out of the picture. This is just my preference for this project. 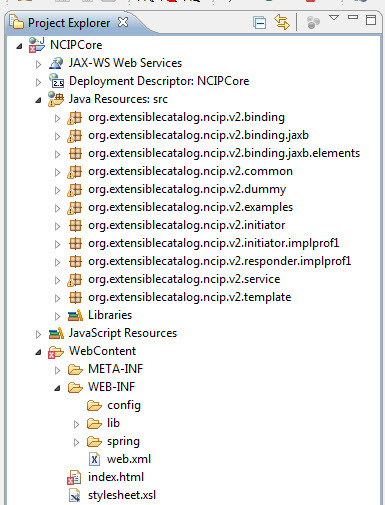 into my Eclipse project NCIPCore/WebContent/. 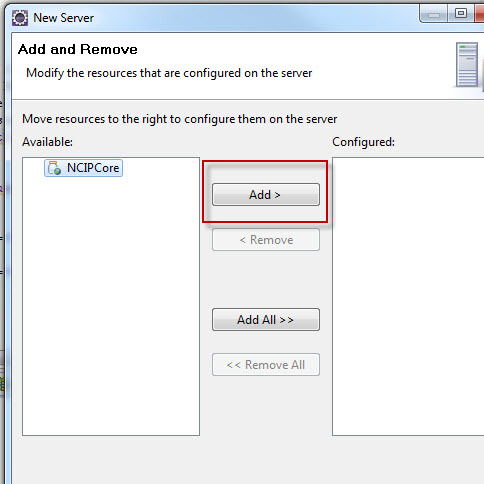 Create the following packages in the NCIPCore project, src folder, as shown in Figure 2. 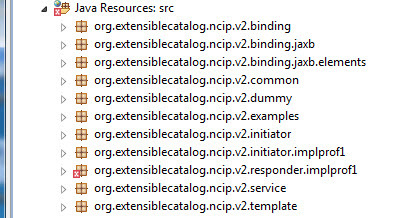 Copy all of the .java files from /folder_where_I_downloaded_code/ into packages (as illustrated above) within the /NCIPCore/src folder. The project should look similar to Figure 3. Next, clean up a couple of the errors in the project and get it running on Tomcat. Figure 7. Index.html file that comes with the XC NCIP Toolkit. Figure 7 shows the index.html file that comes with the Toolkit. You can use it to send test NCIP XML Requests to the application. 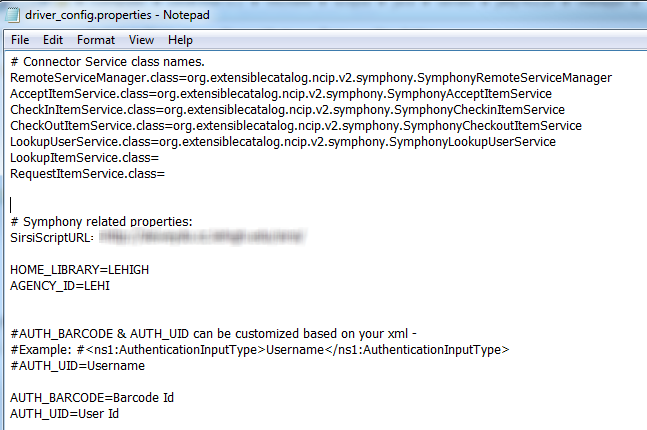 Sample XML can be found on the XC NCIP2 Toolkit Google Code site . By default the XC Toolkit is configured to use the “dummy connectors” that come with the project. These configuration settings are located the driver_config.properties file (Figure 8) which was placed into the NCIP_ROOT_DIR environmental variable folder. Then, the performService method of the MessageHandler class uses the configuration files to detect which connector service will process this request. Out-of-the-box this will be one of the ‘dummy’ services that come with the XC Toolkit core. The eXtensible Catalog Organization has written documentation to explain these classes and relationships in much more detail. You can find this documentation on their Google Code site . This is where the XC Toolkit core functionality needs the connector code (to replace the dummy connector classes). The connector code must consist of one Class for each supported service. The connector Classes are the bridge. They are responsible for communicating with the catalog, parsing those results and returning a response object back to the MessageHander.performService method as you see above. In addition to the service classes there is a SymphonyRemoteServiceManager and several other classes created to hold results, errors or constants. 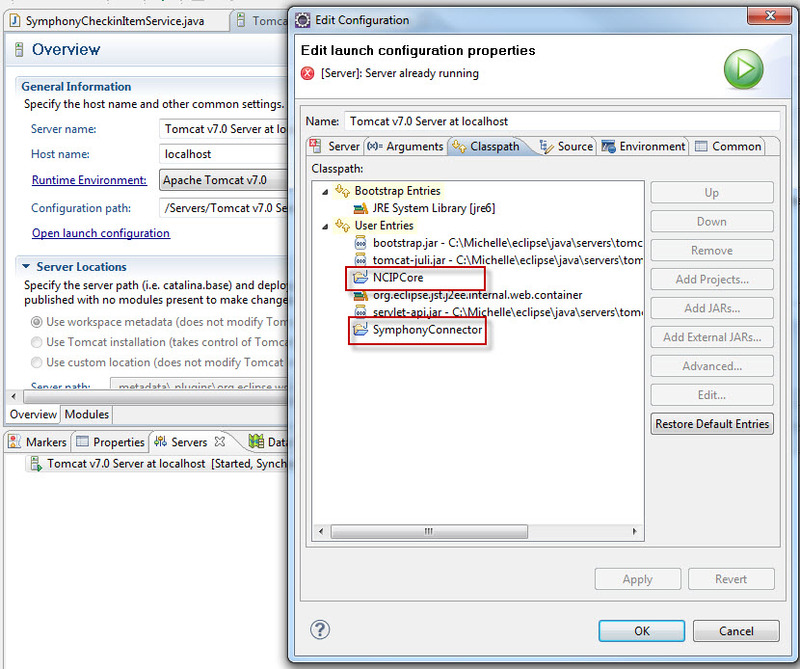 The Service classes (one for each supported service) and the SymphonyRemoteServiceManager class are part of the framework suggested by the Extensible Catalog Organization for any connectors developed to extend the Toolkit. This framework is consistent among the other connectors that have been developed to date. The eXtensible Catalog Organization does an excellent job of explaining the framework and guidelines for connector development . …which are then returned to the Service class. The connector service class populates the response data object which will be returned back to the Toolkit Core Code. The Toolkit Core code will then transform the response object into XML to send back as the response. 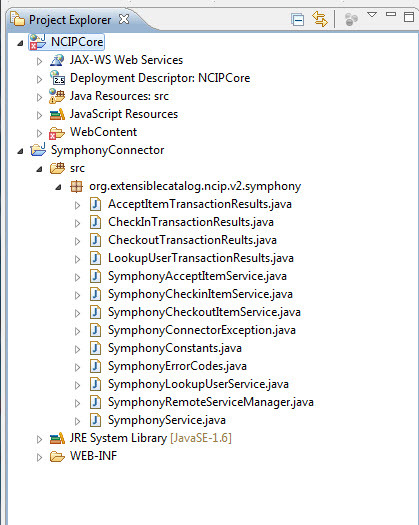 All of the Symphony Connector Java code has been open-sourced. It can be found on the XC NCIP2 Toolkit Google Code Website . We have been using the Toolkit and the connector code in a production environment (on Jetty) since late March 2011. Since then, the services have been called approximately 4,000 times without any downtime or issues. While this is not a terribly high volume, we have been happy with the stability and performance. In the end, I can’t help but to reflect upon the simple process of the Symphony connector code. It validates input, calls an API, parses the results and constructs and populates the response object. There are approximately fifty services that make up the entire NCIP protocol. The code that makes up the Symphony connector – just four services – is reliable and does exactly what we needed it to do support our patrons use of the Relais EZ-Borrow software. However, as the Symphony connector code grows to fully support all of the NCIP services, I would like to see the design be considered so that it scales in a clean and elegant manor. I am thinking along the lines of mapping the XML elements to the Sirsi API codes to maximize reuse of the Java clases. If you are interested in getting involved with the XC NCIP2 Toolkit project, there is a bi-weekly conference call managed by Randy Cook  who is the project manager for XC. Randy and the developers that work on this project have been wonderful to work with and extremely responsive to all of my questions. This is a worthy project with the potential to benefit any organization looking for a way to access their catalog using NCIP. Michelle Suranofsky is a Sr. Developer at Lehigh University in Bethlehem, PA. Before joining Lehigh in 2010, Michelle worked for 10 years developing and maintaining Web applications primarily with Java at Chubb Insurance. She can be contacted at mis306@lehigh.edu.